Celtic coach John Kennedy has absolved club captain Scott Brown of blame for the ugly scenes at the end of their 2-1 victory over Rangers at the weekend. Visiting full-back Andy Halliday took exception to Brown celebrating in front of Rangers supporters at the final whistle and had to be kept away from the veteran by goalkeeper Scott Bain. Halliday received a second yellow card for his part in the fracas, while Daniel Candeias and reserve goalkeeper Wes Foderingham were fortunate to escape punishment. Rangers striker Alfredo Morelos had earlier been ordered off for elbowing Brown in the face and Ryan Kent will almost certainly be offered a retrospective two-match ban for decking him immediately after Celtic’s winning goal. Kennedy argued that it was the Rangers players and not the Celtic captain who lost their discipline in spite of Rangers boss Steven Gerrard claiming that Brown “provoked” his players. “I think it’s ludicrous, to be honest,” said Kennedy. “If you look at the incidents, especially the one with Ryan Kent, he has stood there with his hands by his side and rolled the ball away behind him – and he’s been punched in the face. “There is no excuse for that. I have been a player myself and I know there is emotion in the game, I understand that. But whether it’s on the pitch or on a Saturday night out with your mates, you control your actions. Whatever you do, you have to take responsibility for your actions. On the pitch it’s even more important because you are a role model for thousands of people and there are cameras all over the place. You know you can’t get away with it. Scott Brown here has done absolutely nothing wrong. In terms of the Morelos [case], he did nothing wrong and was elbowed in the face. “He has nothing to answer for. In terms of our mentality as a club, the players know if they step out of line they could be fined or whatever else. But the ultimate thing is they have let their team, the club and, ultimately, the fans down because it can cost results. “Scott knows that and that’s why his disciplinary record is as good as it is. With the big rammy at the end, there was a tackle from Kristoffer Ajer on James Tavernier then Callum McGregor has put it out for a throw-in. “The whistle goes and everyone is down in that corner. “It’s not as if Scott ran from that side of the pitch to go to the Rangers fans. We were there at the time, he’s had a quick celebration and he [remains] on the pitch. Kennedy insists that Brown, who will be 34 in June, is a model professional and that his dedication to his profession is inspirational for the younger players at the club. “He has this never-say-die attitude, whether it’s in a game or a period of his career when his form isn’t great,” he said. “People question whether his time is coming to an end but he just comes back stronger. That shows the mentality and character of Scott Brown. • John Kennedy was speaking as he promoted Celtic’s season-ticket renewals for 2019/20. 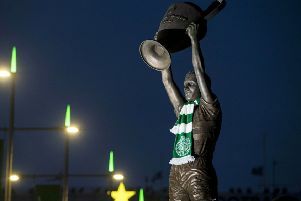 Go to celticseasontickets.co.uk for details.